The Edimax EW-7822UAC USB 3.0 adapter is the next generation of Wi-Fi adapter, compatible with the draft 802.11ac standard and delivering speeds of up to 867Mbps at 5GHz - almost three times as fast as 802.11n. 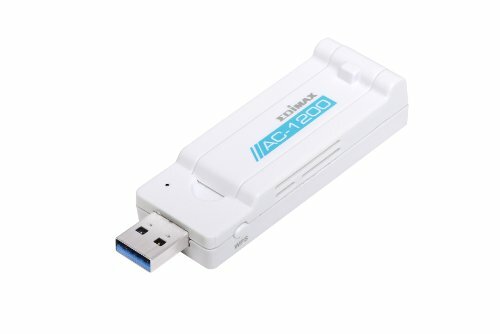 The EW-7822AC is the first adapter of its kind to offer 802.11ac speeds together with USB 3.0 connectivity. Upgrade PCâ€™s and notebooks to super high speed 802.11ac Wi-Fi and enjoy streaming video and data at speeds of up to 867Mbps. USB 3.0 is up to 10 times faster than USB 2.0 and specifies a maximum transmission speed of up to 5Gbps. Providing quicker data transmission times, and backwards compatibility with USB 2.0 (which specifies a maximum speed of 480Mbps), USB 3.0 is the new standard in connectivity â€“ enabling devices to achieve the superfast speeds which 802.11ac can provide. Enjoy better performance and greater flexibility for your Wi-Fi devices, using dual-band connectivity. The EW-7822UAC provides concurrent connectivity for the 2.4GHz band and 5GHz band at speeds of 300Mbps and 867Mbps respectively. The EW-7822UACâ€™s sleek design features an adjustable foldaway antenna, allowing users to adjust the antennaâ€™s angle for optimum Wi-Fi performance and fold back the antenna to minimize size when itâ€™s not in use."